The pileated woodpecker (Dryocopus pileatus) is a woodpecker native to North America. This insectivorous bird is a mostly sedentary inhabitant of deciduous forests in eastern North America, the Great Lakes, the boreal forests of Canada, and parts of the Pacific coast. It is the second-largest woodpecker on the continent, after the critically endangered—and possibly extinct—ivory-billed woodpecker. The term "pileated" refers to the bird's prominent red crest, with the term from the Latin pileatus meaning "capped". Adults are 40 to 49 cm (16 to 19 in) long, span 66 to 75 cm (26 to 30 in) across the wings, and weigh 250 to 400 g (8.8 to 14.1 oz), with an average weight of 300 g (11 oz). Each wing measures 21.4 to 25.3 cm (8.4 to 10.0 in), the tail measures 14.0 to 17.4 cm (5.5 to 6.9 in), the bill is 4.1 to 6.0 cm (1.6 to 2.4 in) and the tarsus measures 3.1 to 3.8 cm (1.2 to 1.5 in). They are mainly black with a red crest, and have a white line down the sides of the throat. They show white on the wings in flight. The flight of these birds is strong and direct, but undulates in the way characteristic of woodpeckers. Adult males have a red line from the bill to the throat, in adult females these are black. Two species found in the Old World, the white-bellied and black woodpeckers, are closely related and occupy the same ecological niche in their respective ranges that the pileated occupies in North America. The only North American birds of similar plumage and size are the ivory-billed woodpecker of the southeastern United States and Cuba, and the related imperial woodpecker of Mexico. However, unlike the pileated, both of those species are extremely rare, if not extinct. Most reports of the ivory-billed woodpecker are believed to be erroneous reports of the far more common pileated. Up to four subspecies of pileated woodpeckers have been recognized historically. However, many authors only recognize two subspecies, the southernly D. p. subsp. pileatus and the northerly D. p. subsp. abieticola, and the differences between the other two subspecies other than range are not well described. Generally, pileated woodpeckers follow Bergmann's rule being smaller and more compact in the south (D. p. subsp. pileatus) and larger in the north (D. p. subsp. abieticola). The ranges of the potential four subspecies are described below. Their breeding habitat is forested areas across Canada, the eastern United States, and parts of the Pacific coast. This bird favors mature forests and heavily wooded parks. They specifically prefer mesic habitats with large, mature hardwood trees, often being found in large tracts of forest. However, they also inhabit smaller woodlots as long as they have a scattering of tall trees. Efforts to restore woodland by removing invasive honeysuckle and buckthorn seem to benefit them, as the removal of brush and shrubbery facilitates their foraging on the ground and in the lower stratum. From 1966 - 2015 the population of pileated woodpecker has, on average, increased by greater than 1.5% per year throughout the northeastern US, The Maritimes, the Ohio River valley, and around the Great Lakes. These birds mainly eat insects, especially carpenter ants and wood-boring beetle larvae. They also eat fruits, nuts, and berries, including poison ivy berries. 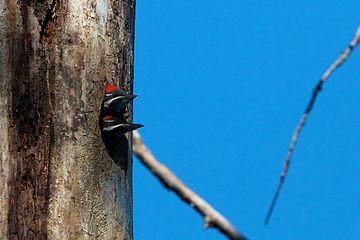 Pileated woodpeckers often chip out large and roughly rectangular holes in trees while searching out insects, especially ant colonies. They also lap up ants by reaching with their long tongues into crevices. They are self-assured on the vertical surfaces of large trees, but can seem awkward while feeding on small branches and vines. Pileated woodpeckers may also forage on or near the ground, especially around fallen, dead trees, which can contain a variety of insect life. They may forage around the sides of human homes or even cars, and can occasionally be attracted to suet-type feeders. Although they are less likely feeder visitors than smaller woodpeckers, pileateds may regularly be attracted to them in areas experiencing harsh winter conditions. Usually, pileated woodpeckers excavate their large nests in the cavities of dead trees. Woodpeckers make such large holes in dead trees that the holes can cause a small tree to break in half. The roost of a pileated woodpecker usually has multiple entrance holes. Pileated woodpeckers raise their young every year in a hole in a tree. In April, the hole made by the male attracts a female for mating and raising their young. Once the brood is raised, the pileated woodpeckers abandon the hole and do not use it the next year. When abandoned, these holes—made similarly by all woodpeckers—provide good homes in future years for many forest song birds and a wide variety of other animals. Owls and tree-nesting ducks may largely rely on holes made by pileateds in which to lay their nests. Even mammals such as raccoons may use them. 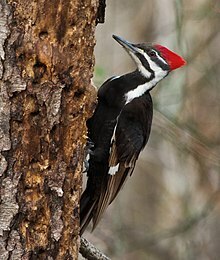 Other woodpeckers and smaller birds such as wrens may be attracted to pileated holes to feed on the insects found in them. Ecologically, the entire woodpecker family is important to the well being of many other bird species. The pileated woodpecker also nests in boxes about 4.6 m (15 ft) off the ground. A pileated woodpecker pair stays together on its territory all year round and is not migratory. They defend the territory in all seasons, but tolerate floaters during the winter. When clashing with conspecifics, they engage in much chasing, calling, striking with the wings, and jabbing with the bill. Drumming is most commonly to proclaim a territory, and hollow trees are often used to make the most resonant sound possible. The display drum consists of a burst of 11 to 30 taps delivered in less than a second. Pileated woodpeckers have been observed to move to another site if any eggs have fallen out of the nest—a rare habit in birds. The cavity is unlined except for wood chips. Both parents incubate three to five eggs for 12 to 16 days. The average clutch size is four per nest. The young may take a month to fledge. The oldest known pileated woodpecker was 12 years and 11 months old. Predators at the nest can include American martens, weasels, squirrels, rat snakes, and gray foxes. Free-flying adults have fewer predators, but can be taken in some numbers by Cooper's hawks, northern goshawks, red-shouldered hawks, red-tailed hawks, great horned owls, bald eagles, golden eagles and barred owls. The pileated woodpecker occupies a large range and is quite adaptable. Its ability to survive in many wooded habitat types has allowed the species to survive human habitation of North America much better than the more specialized ivory-billed woodpecker. Pileated woodpeckers have a large population size, and despite being nonmigratory, are protected under the U.S. Migratory Bird Act. While the large birds control many insect populations, especially tree beetles, that may otherwise experience outbreaks, some people may consider them harmful if found on their property due to the considerable damage that pileated woodpeckers can do to trees and homes. ^ BirdLife International (2012). "Dryocopus pileatus". IUCN Red List of Threatened Species. Version 2013.2. International Union for Conservation of Nature. Retrieved 26 November 2013. ^ "Ivory-Billed Woodpecker, Life History". The Cornell Lab of Ornithology; All About Birds. Cornell University. Retrieved 21 March 2016. ^ Garcia, Evan (7 April 2016). "More Pileated Woodpeckers: Emerald Ash Borer or Healthier Habitat?". Chicago Tonight. Retrieved 28 August 2018. ^ "Pileated Woodpecker Dryocopus pileatus". Patuxent Wildlife Research Center. U.S. Geological Survey. Retrieved 2019-01-02. ^ Beal, F.E. (1895). Preliminary report on the food of Woodpeckers. United States Department of Agriculture. Division of Ornithology and Mammalogy. Bulletin No. 7. Government Printing Office. Washington, District of Columbia. p. 32. ^ "Pileated Woodpecker tapping twice". Big Woods Conservation Partnership. Cornell University. 2018. Retrieved 20 August 2018. ^ "Pileated Woodpecker". Archived from the original on July 17, 2012. Retrieved June 20, 2012. Wikimedia Commons has media related to Pileated woodpecker. "Pileated woodpecker media". Internet Bird Collection.